​Does anybody know if one can write conditional formatting into a NAV report (a standard NAV report, not a JET report)? 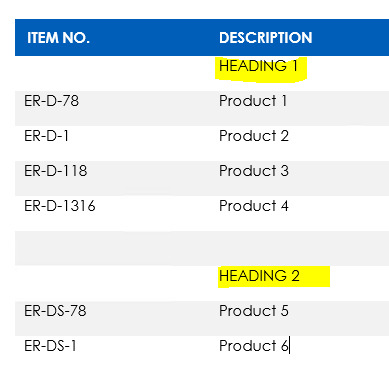 I want a rule in the Word/SQL template that looks at the Sales Quote lines and says that when 'Type' = [blank] then the text in the 'Description' field should be in bold. So in the below example, I would like the highlighted areas to display in bold. I'm not sure if there's a way to do this in a Word layout. Let me know if this is what you were looking for. ​Thanks David, it worked! I knew it must be possible, but our developer told me it wasn't. Guess I'll be writing and formatting my own reports going forward. That's great Elize, I'm glad it worked for you!